Indian Wedding Suits for men Indo-western Designer look. Looks dashing! 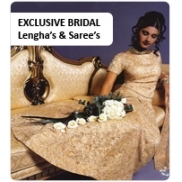 High quality materials an..
Georgette with antique zardozi, sequins, resham and stones work finishes. Best quality fabric ans.. Exquisite Brown & Bronze With Silver Embroidery .. Traditional Bridal Paneled lehenga is a perfect combination of Red, Gold and Teal colors. The Vel..
white and bronze sherwani formal and wedding suit ..
golden yellow and bronze sherwani formal and wedding suit ..
Bollywoodstores Aishwarya Rai elegant black and shimmering gold saree geogette two colour tone. ..
bronze and blue mens sherwani suit special and wedding occasions ..
bronze and ivory mens sherwani suit special and wedding occasions ..
bronze mens sherwani suit special and wedding occasions ..
Diya mirza black saree with gold sequence. Black Georgette Saree with gold sequence unstitch ..
brown and bronze mens sherwani suit special and wedding occasions ..
Diya mirza black saree Black Georgette Saree With Heavy Work Unstitch Blouse : Hea..
Karrena Kapoor Designer Salwar Kameez bollywoodstores ra one hot pink saree ..
Deepika Padukon blue and emerald net saree ..
green and bronze mens sherwani suit special and wedding occasions ..
Deepika Padukone stunning black gold kameez ..
LATEST DESIGNER AISHWARIYA RAI BACHAAN SAREE Aishawarya Rai wears another fabulous Sabyasach..
Aishwarya Rai Bachchan Elegant Designer Saree. This saree is half net white, the top half of ..
Gold and bronze mens sherwani suit special and wedding occasions ..
Indian Bollywood Actress Katrina Kaif Saree With Black Net & Front Black Blouse colour : ..